The Carolina Panthers squeaked out a win over the Buffalo Bills today 9-3 but lost TE Greg Olsen in the process. Olsen caught just 1 of his two targets for 10 yards in week 2, after gaining just 18 yards on four receptions in week 1. Fantasy football owners spent a top 50 pick on the TE, who had been one of the safest picks since joining the Panthers. 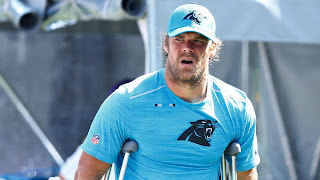 Ed Dickson is now the Panthers starting TE and has the ability to produce. I would imagine that this will help Christian McCaffrey and Kelvin Benjamin see more targets moving forward, but is not great for Cam Newton, who has struggled through two weeks. Bears running back Jordan Howard was seen wearing a sling, which only makes rookie Tarik Cohen even more valuable for those who picked him up after week 1.